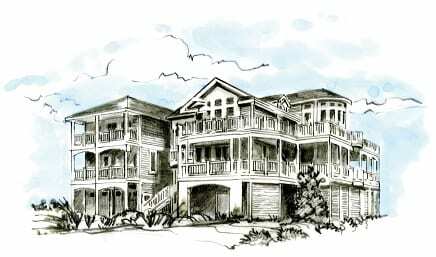 The Outer Banks Home Builders Association’s 25th Annual Parade of Homes opens at 10 a.m. on Oct. 5 and runs through 3 p.m. on Sunday, Oct. 8. It is a Parade with an identity all its own. Look for profiles of the Parade’s homes each day in the Voice. Sea Fore Ever was designed and built to serve its stunning location. From expansive views of the Atlantic, to thoughtful amenities that optimize your beach vacation, the details define this home. Premium materials, custom cabinetry and expert fit and finish contribute to a sense of understated tasteful elegance that reflects the home’s tranquil surroundings. However, there is more to offer than sedate sea-gazing. This ten-bedroom home offers amenities for young and old, from the custom pool with built-in hot tub to the theater room and well-appointed kitchen, there is space for everyone to relax and enjoy. Travel north on N.C. 12 through Southern Shores and Duck, crossing into Currituck County, turn right on Dolphin Street and continue east toward the ocean. Turn left on Lighthouse Drive. The home will be on your right (oceanfront) 1.5 blocks north of Dolphin Street. We would like to express our pride in our team of subcontractors who created this magnificent home. Special recognition goes to the OBHBA Member companies which include Lightning Marine Construction, Barkley Plumbing, Davco Electric, Carolina Flooring , Cozy Kitchen Group, Artisan Concrete and Nancy Pugh Interiors. Finch and Co., Inc., has been designing and building homes and commercial projects from Hatteras Island to Corolla since 1980. We have an experienced staff and trusted sub-contractors which allows for efficient scheduling. Our process is honest and open, and we strive to make building enjoyable. We take pride in our work, and our service after the sale is second to none.